Confession time: I don’t play with my kids enough. The problem with playtime is, I’m a visual person, and I like to be able to see results at the end of a day or task. After cleaning the dishes, I can see that they’ve all been washed. Or after the laundry is done, I’m happy that I’ve completed washing/drying/folding a certain number of loads. 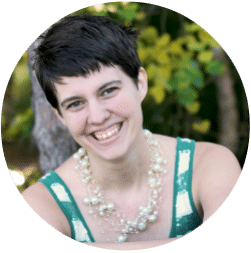 Even with blogging, I’m able to track the number of posts I’ve written during a naptime or the amount of images I’ve created. Playing is completely different. There is no set start or stop and there’s nothing tangible to show for it when I’m done. It’s not something that can be measured, and it’s “results” come over time. But it is still so important. It’s something that I’m working on, and recently I’ve discovered something that has really helped me to keep my focus during the day. I’ve started to schedule playtime with my kids. I add it to my daily to-do list, along with everything else that I want to do throughout the day. Spending time with my kiddos, and showing them love in a way they understand (a.k.a. playtime) is so much more important than any of the items on my never ending to-do list. Yes, I need to clean the house. 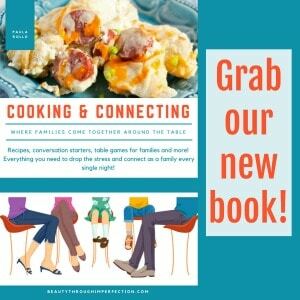 Sure, dinner needs to be made and we all need clean clothes to wear. My writing needs to get done and the floor must be vacuumed at some point, but that doesn’t mean I don’t have time to play. I have to make the time. I have to remember that what seems so insignificant in my mind, is everything to my kiddos. And one day, they will look back and remember laughing with me. They will remember that I took time for them, and didn’t say ‘no’ every time they asked to hear a story or play a game. I don’t say yes every time either. Or I would literally get nothing done. But I’m learning to say yes more. I’m starting to initiate playtime too. To run over to my son while he’s enthralled in his trucks and as if I can join in. The smile that lights up his face when I do this is so beautiful and the memories we make together are pretty wonderful too. My little schedule that includes playtime multiple times a day might seem impersonal or silly to some, but it’s doing wonders for my relationship with my kiddos. To me, that’s what matters most. Maybe one day, I won’t need to schedule it, to remind myself of it’s importance, but right now, playing can sometimes feel like a chore. I love my children, but I’m not particularly fond of trains or reading the same book 5 times in a row. So I have to remind myself to do it. Remind myself it’s a way I can show love, to my little ones who are just learning how to define love and affection. I’ll let you in on a little secret though, it’s been really fun. We’ve laughed more together than we have in a long time, and I’ve gotten a lot more done around the house in the time between playing too. It’s a huge win all around. 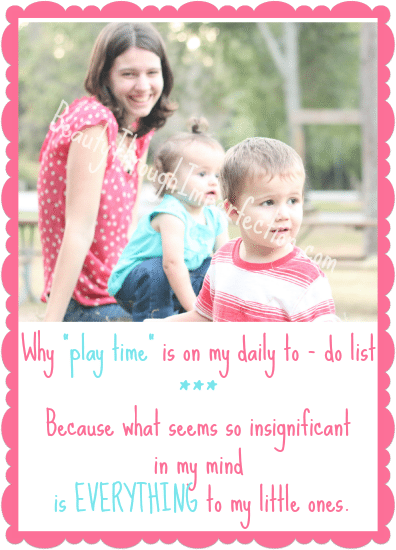 Do you schedule out playtime, or just naturally do it throughout the day? Do you think scheduling it might help you to keep your priorities straight throughout the day too? Click here to read more in the Confessions of an Imperfect Mother series. I have One-on-One time on the schedule every day Monday-Saturday, which sounds much like the same idea. I stop all cleaning/phone calls/computer and just focus on each of my daughters. I let them choose the activity – games, playing dolls, baking, reading, snuggling…whatever they need that day. I really love this, and one of my goals is to do this more. I am a big scheduler so this would definitely work for me. Thanks for sharing your heart! I schedule time every day as well. Otherwise I get busy with other things and it just doesn’t happen. I know they NEED it and that they are only with me for a short time in their life and I want to make the most of my time with them and build memories with them. So refreshing, Paula! I struggle with the same thing! I loved how you said that playtime may not mean much to us but it’s everything to little ones. So true! Playtime really is everything to my kids and they really need and thrive off of it. Thanks for the encouragement! And I have to agree, those days I make time to play with my kids, I do seem to get more stuff done around the house, too. I need to start scheduling it as well. That doesn’t seem silly or impersonal to me at all! It pays to be intentional. I told my husband last week that I was going to make it a goal to spend 15 minutes of one on one time every day with our three year old. I know, only 15 seems pathetic, but I’m hoping it’s a step in the right direction. 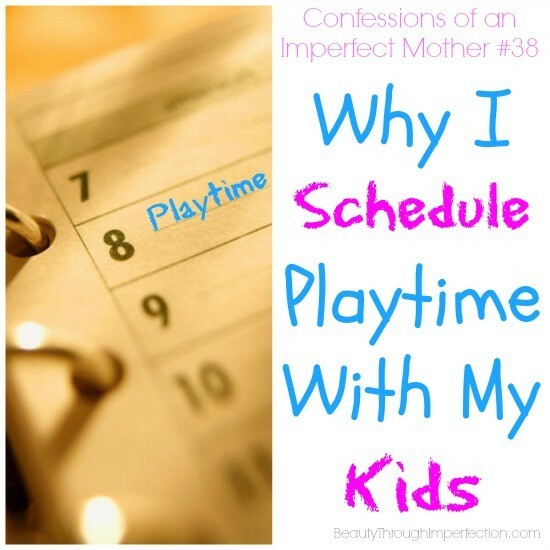 Hey Buddy!, I found this information for you: "Why I Schedule Playtime With My Kids – Confessions of an Imperfect Mother #38". Here is the website link: https://www.beautythroughimperfection.com/schedule-playtime-kids/. Thank you.